Based in Rostock, Germany, A-ROSA was created in 2000 as a subsidiary of P&O Cruises to serve the German cruise market. Alongside sister cruise line AIDA, A-ROSA reflected AIDA's contemporary and unfussy sensibility with relaxed dress codes, less-structured dining and a recreationally active onboard ambience. Beyond its focus on rivers, rather than the oceans that AIDA trawls, where it differed was in its more upscale nature. A-ROSA was -- and still is -- one of the most inclusive river lines afloat. Dedicated five ships to the English-speaking market, offering the most inclusive river cruise experiences in European waters. Perfect for active travelers and families. All open-seating dining serving healthy Mediterranean cuisine. Carnival Corporation bought P&O Cruises in 2003, and A-ROSA was eventually sold off to a private company. It's run by Lars Clasen, who originally served as AIDA's chief and created the A-ROSA brand in the first place. 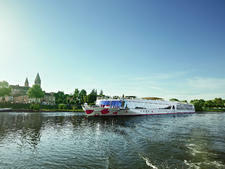 These days, A-ROSA operates 11 riverboats, all in Europe, all reflecting its contemporary design sensibilities. It offers German travelers itineraries that include the Danube, Rhine, Maine, Moselle, Seine, Rhone and Saone. 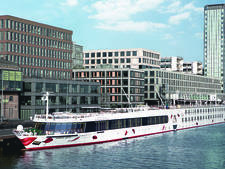 In 2013, for the first time, A-ROSA dedicated three ships -- A-ROSA Stella, A-ROSA Silva and A-ROSA Aqua -- to the English-speaking market for a series of cruises on the Rhine, Danube and Rhone/Saone. These cruises, dedicated 100 percent to English-speaking travelers, offer one of cruising's most inclusive fares (from air and transfers to anytime-cocktails and shore excursions). Since then, they have designated three more ships to serve the "international" market -- A-ROSA Donna, A-ROSA Viva and A-ROSA Flora -- and returned A-ROSA Aqua to the German-speaking market. 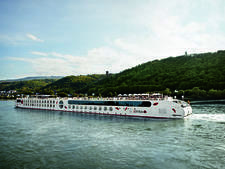 A-ROSA Cruises, which operates five riverboats for the English-speaking market on Rhine, Rhone/Saone and Danube itineraries, features a dynamic onboard ambiance. Color schemes are elegant but bright and vivid. Features and amenities are among the most elaborate on Europe's rivers and aimed at a more active (and sometimes younger) traveler. The line's ships also boast spas that are the river industry's largest, as well as top-deck pools. Some cabins have sofa beds (a rarity in the riverboat arena) for families. In fact, A-ROSA's been targeting the family market a lot longer than many river lines, mainly due to the fact the ships have always cultivated a younger ambiance onboard. A-ROSA is the only river cruise line to offer free cruises for children under 15 on all its departures and all itineraries. One child can cruise for free for every full paying adult and a variety of cabin options are available depending on the ship including family cabins, suites and cabins with one extra bed and interconnecting cabins. A-ROSA has indoor and outdoor restaurants, and, true to its German heritage, it places somewhat more emphasis on buffet stations than most river lines. (Its dining is on par with that found on other luxury ships, and the buffet aspect is equally upmarket.) All dining is open-seating, and cuisine is Mediterranean, offering fresh and healthy choices. Because cocktails are included in the cruise fares, the atmosphere onboard is more akin to a big, moving cocktail party than a stuffy cruise experience. The spas, salons and fitness facilities deserve special mention. Trainers and massage therapists are onboard, beauty treatments are offered, and the sauna -- with a view outside to the river -- is spacious. Cabins, as on most riverboats, are located on three decks. All standard cabins are the same size, about 156 square feet. Those on Deck One are the most economical, with portholes about two-thirds of the way up the wall. Some have third beds. Cabins on Decks Two and Three feature French verandahs and beds that can convert from two twins to a queen. Ships also offer a handful of suites. The sun deck is the heart of the ship during the daytime. It's outfitted with shuffleboard, a giant chess set, comfortable chairs and loungers (with an awning for shade), a swimming pool and a buffet setup for casual meals. At other times, the ship's lounge, located all the way forward, is a prime spot for evening entertainment and enrichment activities. 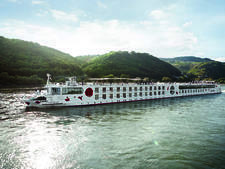 Limited to English-speaking passengers, A-ROSA's North American-oriented cruises appeal to well-traveled, sophisticated passengers who are just discovering European river cruising and want to sail on one of the mainstream rivers. Five of the cruise line's 11 vessels have been designated "international ships", i.e. they offer cruises for English-speaking travelers rather than just Germans. A-ROSA Stella, which sails France's Rhone and Saone between Lyon and Arles, holds 174 passengers and was built in 2005. A-ROSA Silva, the newest ship, was built in 2012. 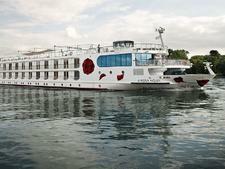 It holds 186 passengers and cruises the Danube between Passau and Budapest. The other three are A-ROSA Donna, A-ROSA Viva and A-ROSA Flora.